Mackie PROFX16v2 Pro 16 Channel 4 Bus Mixer w Effects and USB PROFX16 V2+Stand by Mackie at Riot Recordings. MPN: ProFX16v2+RXS20. Hurry! Limited time offer. Offer valid only while supplies last. The ProFXv2 Series mixers provide a comprehensive live sound solution, with models from 4- to 30-channels, covering a huge range of applications. The ProFXv2 Series mixers provide a comprehensive live sound solution, with models from 4- to 30-channels, covering a huge range of applications. Delivering unmatched sound quality, ProFXv2 features all-new VitaTM preamps, which are virtually noiseless and designed specifically for the highly- dynamic world of live sound. PROFX16v2 Pro 16 Channel 4 Bus Mixer w Effects and USB. UNMATCHED SOUND QUALITY. 10 extremely low-noise Mackie VitaTM mic preamps designed to add life to any input. All-new ReadyFXTM effects engine with 16 great-sounding effects like reverbs, delays and choruses. Single-knob channel compression for smooth, even dynamic control (ch. 5-8). NO-COMPROMISE LIVE MIXING. 7-band graphic EQ for tuning mains or monitors. Rockville RXS20 Heavy duty mixer stand. Universal with any mixer up to 300 LBS! Collapsable for maximum portability and easy storage. Adjustable width (13.8" - 23.6" Inches) making this universal for any mixer and other gear. Adjustable Height from 24" - 36" (Inches). Steel stand with sturdy arms. 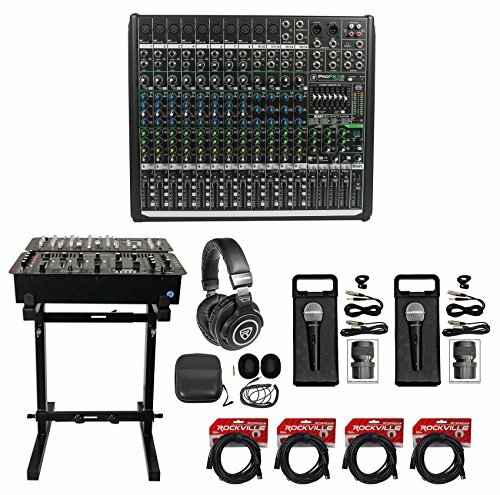 Large enough for mixers, DJ gear, keyboards, and more. Load capacity: 300 LBS 1 MM thick steel all around! This piece is rock solid! At Rockville we only make top quality gear! Rockville PRO-M50 Studio Headphones w/ Detachable Coil Cable, Case+Extra Ear Pad . Professional High-Definition Studio Headphones. 40mm Neodymium drivers. Ergonomically designed swivel ear cups. Supreme sound isolation. Accurate sound reproduction. Minimal bleed. Sturdy and durable steel headband and arms. Soft leather headband cover. Interchangeable leather and soft suede ear cups covers included. Detachable 51" coil cable made of 100% Oxygen Free Copper (158" fully extended).